Window blinds come in many different materials, patterns and colours. Choosing the right ones can benefit any room adding style in the form of Roman, roller, vertical, wooden or metal for a real modern feel. Blinds are traditionally used in kitchens and bathrooms but are now becoming more popular as a window covering in other rooms around the home. The classic Vertical blinds have always been a favourite due their ease of use and the ability to manipulate the light and fresh air. Vertical blinds come in a variety of colours, fabrics and patterns to compliment any decor. They are also child friendly as all chords and chains are kept out of reach of children with child safety devices to ensure there are no accidents. Vertical blind slats can be washed with soap and water but if the blind slat is damaged beyond repair it is very easy to replace individual slats. 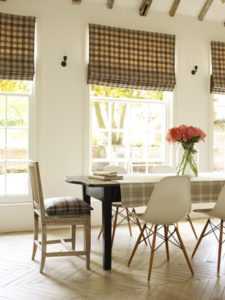 Our range of kitchen blinds are very easy to maintain. Many people opt for roller blinds as they are easy to keep clean and gather less dust. Roller blinds are also a great addition to bathrooms and En-Suites. Privacy – Window blinds give full privacy totally closing off the outside so no one can see through. Choice – Window blinds come in many patterns and styles to add a modern, traditional or contemporary look to the room. Light control – With blinds you can control the amount of sunlight that comes into a room. You can either block it out totally or partially block enough to let the sun shine through. Don’t make this easy mistake. You might like the look of wooden blinds at your bathroom or kitchen windows but with the moisture from bathing and cooking this type of blind can easily become stained and warped over time. Curtain Creation in Surrey have a selection of blinds for both these rooms that are moisture resistant thereby maintaining the look and longevity of the blinds. If sunlight is your concern. Curtain Creation have a range of blinds to either block out light altogether – known as blackout blinds, and vertical or Venetian blinds where light can be controlled so you can let in or block out when required or to suit a mood. Still unsure what blinds to choose? Why not get in touch with Curtain Creation? We can book a home visit for you to discuss the many options we have available. From our range of vertical, Roman, Velux, roller and metal blinds you are bound to find the right blinds for your rooms.